Right now I feel like my life is an amazing mix of so busy and yet so tranquil. It's hard not to feel peaceful when you're holding a sleeping baby. Since I had Sean Patrick I have been working part-time from home and will continue to do so throughout my three month maternity leave. It's a nice combination of keeping me in the loop with my work but also having time to just be with Sean Patrick and the other kids. I have been making dinner almost every night and during the days I've been tackling some bigger projects that I just never seem to have the energy for when I'm working full-time. Right now I'm in the depths of sorting through all five kid's clothes, packing away what is too small and digging out the hand me downs that will fit the younger kids. The plan has always been to keep all the kid stuff until our last child grew out of it and then give whatever is still half-way decent away. Maren being our last little girl, I technically should be not packing her too small clothes away, but instead giving them away. However, I just can't seem to bring myself to do that just yet. Realistically and practically I know Sean Patrick is our last baby. We have neither the room nor finances for another baby. And, even if we did, there is no amount of money that can defeat age. And yet, I just can't seem to wrap my head around that just yet so I continue packing away little girl clothes. Apart from work, the baby and organizational projects, we've been keeping busy with celebrations. We celebrated Chris' birthday by going to our favorite birthday celebration place, Organ Piper Pizza. The organ music show keeps the kids entertained so we can actually sit and eat a full dinner without anyone getting too antsy. This was also our first time taking all five kids out and it went amazingly well. Sean Patrick actually slept through all of it even though we sat right next to the room housing all the organs pipes. Right after Chris' birthday was Shannon's first communion. He looked like such a little man in his shirt and tie. Shannon was pretty excited to receive communion for the first time, although he ended up liking the wine better than the host. And, in the end, I think he liked his cake best of all. The next weekend was Mother's Day. Chris and I enjoyed a wonderful breakfast that he made with the help of Home Chef. Frittata, bacon, frisee salad and English muffins with maple butter. It was so good and so easy to make! Home Chef is a service that allows you to pick from around ten meals a week and they ship you the recipes along with enough ingredients to make two servings of each meal you've selected. Although the service mainly offers dinner selections, they do sometimes have breakfast options and each week they have a fruit/nut snack option as well as now offering smoothies. We've ordered a few times now and have really enjoyed all the meals we've received. It's a nice, convenient way to cook at home without having to track down new recipes and do all the grocery shopping yourself. A definite downside, however, is the packaging waste. Everything is shipped in an insulated box and then each meals ingredients are in separate bags and then often times single ingredients are in even more bags. There is no waste of ingredients however, unlike how I often times find myself throwing away ingredients I bought to use in just one dish. If you haven't tried Home Chef and would like to, I have six free boxes that I can gift so just leave a comment and if I have any left, I'll gift you a free box. 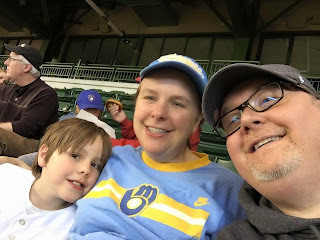 After Mother's Day came our first Brewer's game of the season which should be like celebrating the beginning of summer, but here in Wisconsin is often more of a reminder that summer is still a long way off. The Brewer's haven't been playing very well this year and the game I took Shannon to was no exception. They lost but we still had fun with our good friend Bob tagging along with us. I don't see us using Uber too often but definitely love that there is a cost-effective and convenient option for nights like last night where we know we'll be drinking or even if we're just going somewhere with limited parking and being dropped off and picked up would be easier than driving. If you've never used Uber and want to give it a try and also get $20 off your first ride, you can use this link. The Home Chef and Uber discount links are affiliate links. If you choose to use either, I will receive credits to my accounts with these services.